Relaxshacks.com: The CUB SCOUTS building a tiny house/cabin?? Yup. The CUB SCOUTS building a tiny house/cabin?? Yup. Check this out if you'd be so kind- I'm heading up a fundraiser for Pack 24 on the South Shore in Massachusetts (where I'm Den Leader for the Wolf Scouts). I always enjoyed the Cub Scouts as a kid, and later went on to achieve the rank of Eagle through the Boy Scouts, so I'd like to give back to a local organization by building and designing a backyard cabin, office, playhouse, or seasonal tiny house of sorts- one that we'll auction off (and display publicly). Better yet, the scouts will help us build and design this, all the while learning to swing hammers, cut boards, paint, measure, and well, just BUILD things. There's no better way to learn than to just jump into the thick of things and actually do it, and that's always been the premise of my adult workshops. Plus, you never know, a fun activity like this could inspire one or two kids to become future carpenters, architects, or designers. Check out the video above, it explains it all. For the adults, I AM hosting another small hands-on design and building workshop in late October (the 25th and 26th- 2014)- one that will be limited to only 15 students. Why? I want to keep things intimate and be able to give each attendee a lot of individual attention and help. We'll actually have Dustin Diedricksen ("Dr. Demolition") as a co-host, as well as Jim Shippey, so the student to teacher ratio will be a very awesome five to one. You don't find that elsewhere! Yeah, again, its ACTUAL HANDS-ON BUILDING… LOTS of it… for all skill levels (which includes having NO building experience whatsoever). We'll have more on this soon! It WILL SELL OUT too…. EVERY single workshop we've done in the past has….and we've done LOTS of 'em. 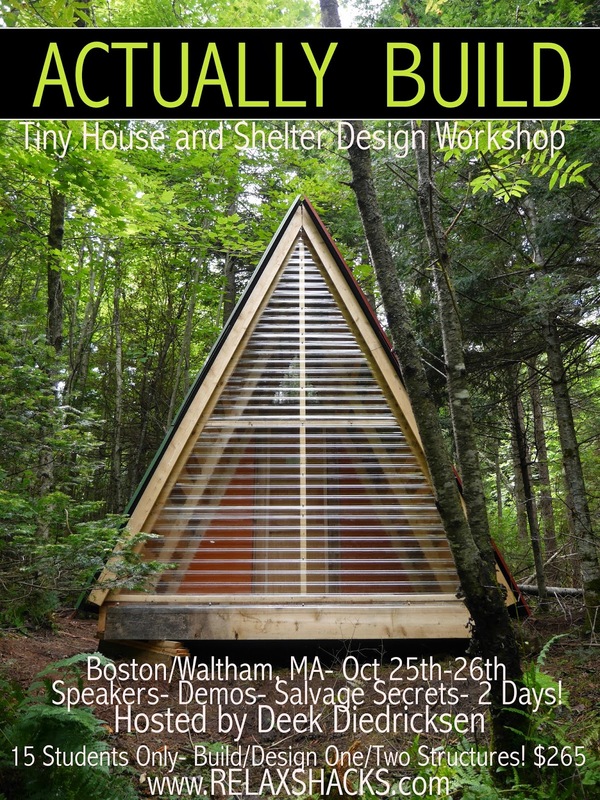 These tiny house building workshops are A LOT of fun- and GREAT for networking.